Create team sites, document libraries, and shared workspaces. Add web parts to create custom pages. Build searchable libraries of PDF files. Link local copies of Word and Excel files to SharePoint workspace copies. Reconcile changes from multiple authors. Use the Explorer Views to drag-and-drop files into SharePoint quickly. Create data lists that look up values from other lists (look-up tables). Group, total, and filter list items using views. Use InfoPath form libraries to collect data. You get the how and why of the top tasks without the tedious menu-by-menu walkthroughs that take hundreds of pages but add little value. 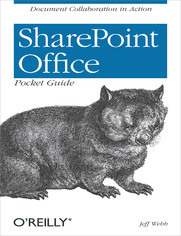 SharePoint Office Pocket Guide also includes a guide to online resources that expand your knowledge of specific topics.